For me, composition is by far the most important aspect of photography and a hot topic among my students. My philosophy is that even when you have great light and great subjects, you’ll still get nothing if you don’t have a pleasing composition. Perfect technique and the best equipment amounts to nothing if your compositions are boring, so it’s essential to take the time to learn as much as you can about composition. This is just a small list of the many compositional topics covered in ‘Visual Flow’. With each topic, Ian includes some beautiful images and helpful diagrams to demonstrate his explanations. Another feature I love about this ebook is that it’s a well formatted PDF document so I can read it on my phone or tablet. This makes it great for reading on location while you’re out on a shoot and need some pointers. iPad users that have the retina display will love the gorgeous images from Ian and George Stocking. You can really tell that the years of experience that Ian and George have accumulated are very present in this ebook. This is not some hastily concocted pamphlet but a carefully crafted piece of informative literature from which photography lovers and artists of all kinds will derive great pleasure. I’ve read the book from beginning to end and I was so impressed that I ask Ian if he’d allow me to sell it here in the Fototripper store and he agreed. 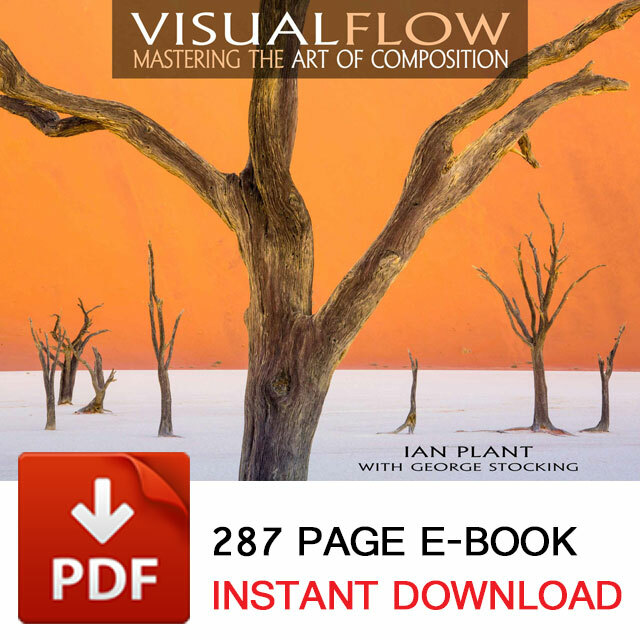 That means that for the price of a modest meal you can download this 287 page digital ebook right now and start to master the art of composition today. I give this ebook my absolute maximum 5 stars.